NOTICE: Activation key must be used on a valid Steam account. Requires internet connection. About the game World War III was one cruel tragedy, at least for the others. 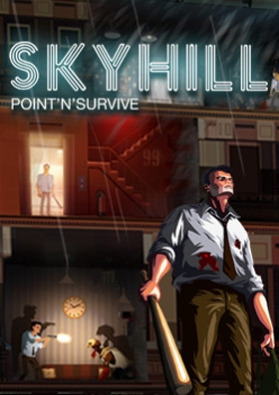 You seemed to have a quite nice time, hidden in your fancy penthouse at the Skyhill Hotel... Till the impact of a bio-weapon blew away the life you once knew. Now there are mutants everywhere, and they're eager to rip you to sh… reds with their vicious claws. But they aren't your only problem: Your supplies are running out. You have to leave your luxurious penthouse and search for food. Walking through the skyscraper means going through hell. There is danger around every corner and death is a steady companion. But seriously, how would someone prepare for something like this? It doesn't matter anymore. Nothing matters but survival. And time is running out. Open the door. Key Features Roguelike RPG gameplay in an apocalyptic survival setting. Feels fresh every session – randomly generated maps. Gain experience, craft weapons and look for useful objects. Face an army of nightmarish creatures. Go for the head or land a body shot – but choose wisely. Everything you find can be helpful. Difficulty levels give you the chance to actually survive this, or try to outlast this hell under the worst conditions. Open end – is there still hope? Come and find out! Various special abilities to unlock. Turn based combat with a sophisticated risk and reward system. Fast travel with the elevator. System Requirements Windows - Minimum OS Version: Windows XP 32 bit SP3 Processor: 2.2 Ghz Dual Core CPU Memory: 4 GB RAM Graphics: ATI Radeon HD 3400 Series, GeForce 205 DirectX Version: 9.0c Disk Space: 1200 MB available space Sound Card: DirectX 9.0c Compatible Sound Card with Latest Drivers Additional Notes: Using the Minimum Configuration, we strongly recommend to use minimal settings in order to not experience low frame rates. Windows - Recommended OS Version: Windows Vista SP2, Windows 7 SP1, Windows 8 (32/64 bit versions) Processor: 2.6 Ghz Dual Core CPU Memory: 6 GB RAM Graphics: AMD Radeon HD 6570, NVIDIA GeForce 9600 GT or higher DirectX Version: 9.0c Disk Space: 1200 MB available space Sound Card: DirectX 9.0c Compatible Sound Card with Latest Drivers	Mac - Minimum OS Version: Lion (10.7) Processor: Intel Dual Core 2.2GHz Memory: 4 GB RAM Graphics: ATI Radeon HD 4670, 300er Nvidia, Intel HD 5200+ Disk Space: 1200 MB available space Sound Card: 16 Bit Mac - Recommended OS Version: (Yosemite) 10.10 Processor: Intel Dual Core 2.5GHz Memory: 4 GB RAM Graphics: Nvidia Gf650, AMD M370x Disk Space: 1200 MB available space Sound Card: 16 Bit © 2015 Daedalic Entertainment GmbH and The Mandragora team. Daedalic and the Daedalic-Logo are trademarks of Daedalic Entertainment GmbH. All rights reserved.